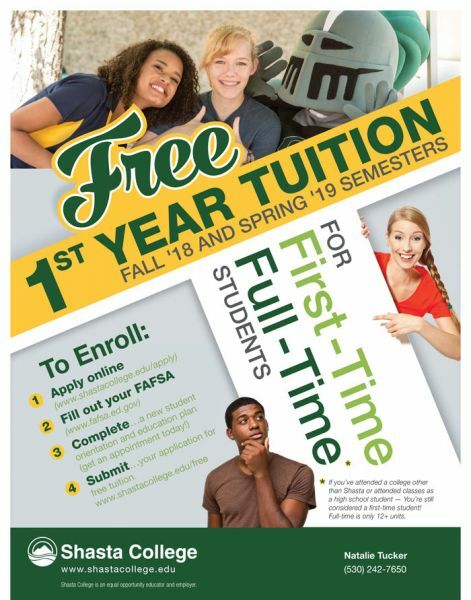 For many students attending Shasta College this Fall their tuition will be free for their first year as long as they are first-time, full-time students. A new program, called The Shasta College Promise Program, is providing students who previously may have avoided going to school due to financial considerations, another chance at obtaining a college education. To qualify for the program, first-time Shasta College students who are California residents need to apply for financial aid, register for 12 units or more, and complete a new student orientation and education plan at the college. Students who completed dual enrollment at their high schools or concurrent or summer enrollment at the college while in high school would still qualify for the Shasta College Promise Program. The Shasta Promise program is funded by a mix of private and public funds. The Governor’s recent budget proposal included funding that, if approved, can be used to supplement other funding sources. For information about the Shasta College Promise Program, contact Ryan Loughrey at 530-242-7656 or rloughrey@shastacollege.edu. Shasta College is part of the California Community College system, which is the largest system of higher education in the world, with 113 colleges organized into 72 districts.